This Easy Marsala Rotisserie Chicken Soup is a filling and flavorful soup that delivers the classic flavors of chicken marsala in a bowl. Best of all, it conveniently uses rotisserie chicken so you can have it on the table in 30 minutes or less. If you’ve ever had chicken marsala, you know how amazing it is. It’s an Italian-American dish made with floured and sautéed chicken that’s smothered in a delicious sauce made of reduced Marsala wine (a dry Italian wine often used in savory Italian dishes), mushrooms, onions, herbs, and other ingredients. 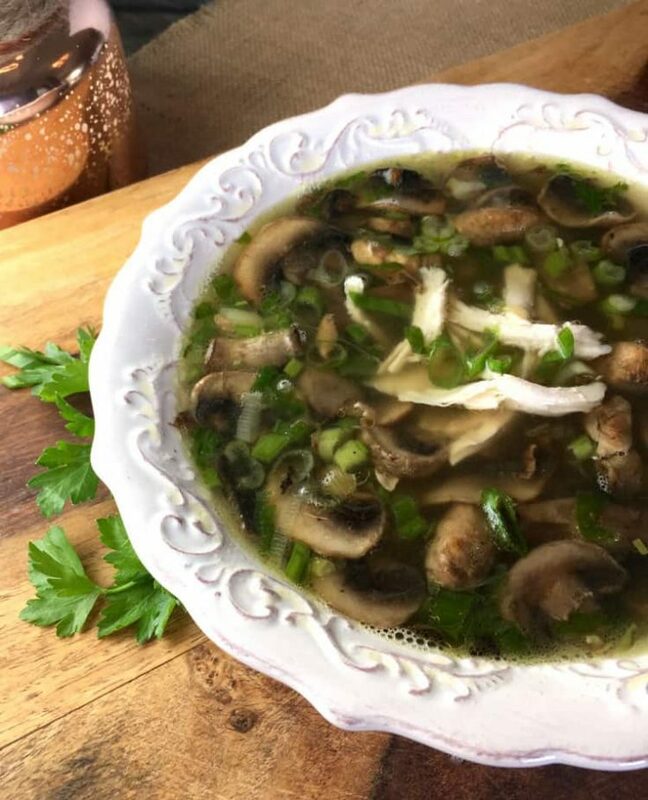 Why not take the wonderful flavors of chicken marsala and make them into an easy-to-make soup, suitable for any time of the year, that can be on the table in 30 minutes or less? Easy Marsala Rotisserie Chicken Soup does just that. The star of this recipe is rotisserie chicken. By using rotisserie chicken in Easy Marsala Rotisserie Chicken Soup, you don’t have to worry about cooking the chicken. Plus, who doesn’t love the flavor of rotisserie chicken? Chicken marsala plus rotisserie chicken is a match made in foodie heaven. You can enjoy this soup year-round. Let’s face it: some hearty, filling soups that are exactly what you need on a cold winter day just won’t work in the summer when you’re craving lighter meals. The last thing you want in the heat of the summer is to eat a bowl of soup that weighs you down and makes you feel lethargic. Easy Marsala Rotisserie Chicken Soup has plenty of liquids (each serving contains a cup of chicken stock), making it a soup that is light enough for summertime. Each serving contains 20 grams of protein. Some soups that are loaded with vegetables and stock can be a bit light on protein. Not this healthy chicken vegetable soup! Each serving contains 20 grams of protein, so it will easily carry you to your next meal. 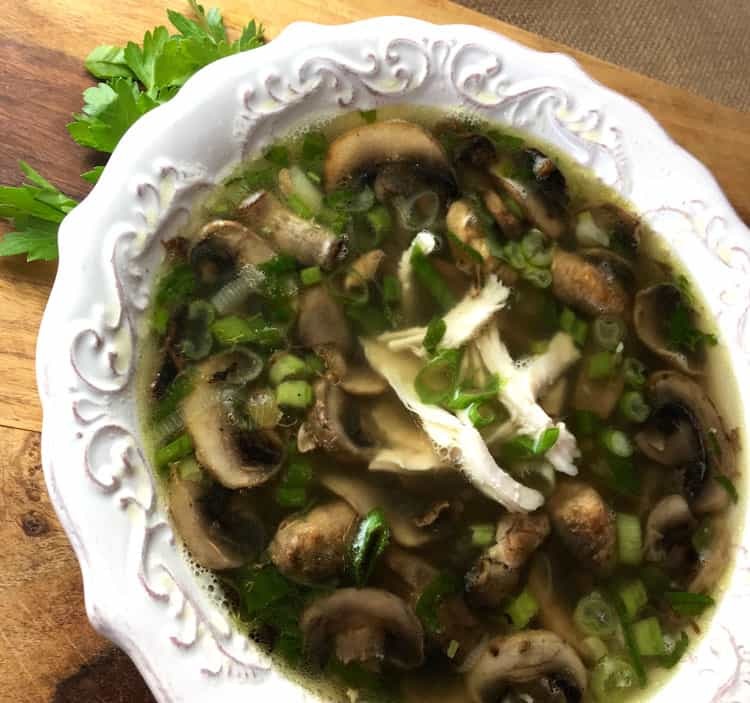 It’s also a good “diet soup.” Each serving contains only 288 calories, and with a full cup of chicken stock in each serving, each serving is quite filling. It’s a great last-minute dinner. Swing by the grocery store after work and grab a rotisserie chicken, a bottle of Marsala wine, and a few other items, and dinner is almost ready! 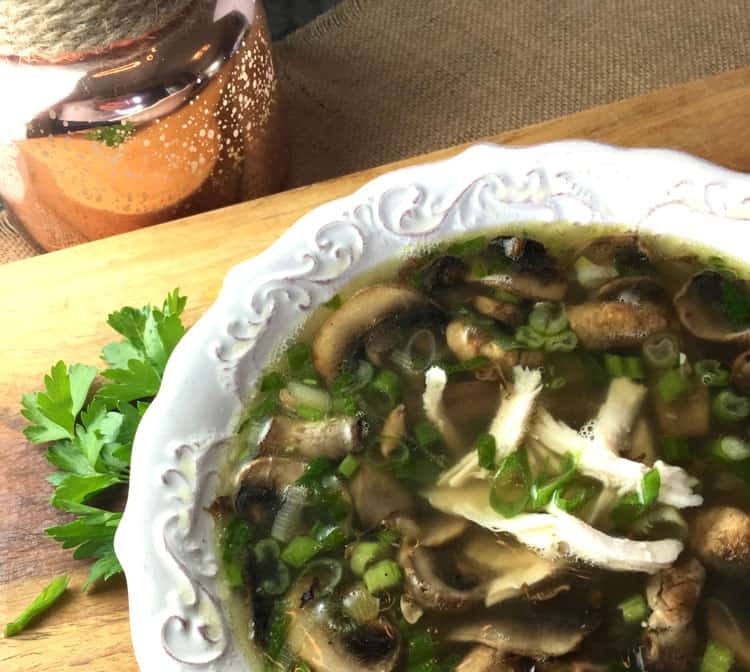 Want More Recipes Like This Easy Marsala Rotisserie Chicken Soup? Weight Watchers Taco Soup: This is another filling “diet soup.” Each two-cup serving has about the same amount of calories as Easy Marsala Rotisserie Chicken Soup, plus it tastes amazing! Cauliflower Goat Cheese Soup – A Tasty Soup Recipe: I love this soup recipe because not only does it taste great, but it’s such an interesting combination of ingredients. The base is an entire head of cauliflower (giving you a thick soup without a lot of calories), and, of course, goat cheese! Cool Strawberry Soup: Who says soup has to be vegetable- and protein-based? This chilled soup is made from strawberries, mint leaves, white wine, lemon juice, honey, and brandy. Soup with a kick! This Easy Marsala Rotisserie Chicken Soup delivers the classic flavors of chicken marsala in a bowl. Over medium-high heat, heat a Dutch oven or heavy soup pot. Add olive oil and mushrooms. Stirring occasionally, cook mushrooms until they begin to release their juices (about 6-7 mins). Season with salt and pepper to taste. To the pan, add white parts of the onion. Cook 1-2 minutes, making sure to stir once or twice. Increase the heat to high and add Marsala wine. Cook until wine is reduced to about 1/3 of its original volume (about 4-5 minutes). To the pan, add chicken stock and shredded chicken. Bring to a boil, and then reduce heat to just slightly below medium. Simmer until thoroughly heated (about 4-5 minutes). Remove from heat and serve. Garnish with green parts of onion.